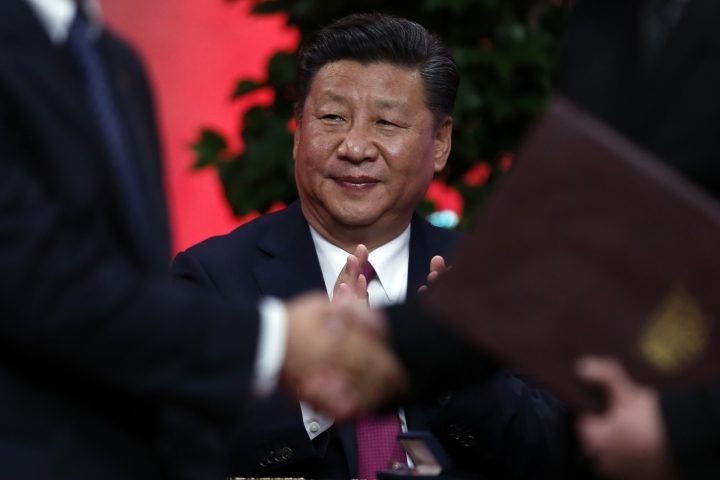 BEIJING — Chinese President Xi Jinping's delegation to next week's World Economic Forum in the Swiss Alpine resort of Davos is open to meeting with President-elect Donald Trump's team, an official said Wednesday. Vice Foreign Minister Li Baodong told reporters at a briefing that "there are open channels of communication" with Trump's team. Bilateral meetings on the sidelines of the annual gathering of business leaders, politicians and cultural icons are still being finalized, but China would look into what sort of arrangements could be made "as long as the schedule permits and if there is the wish," he said. Trump has accused China of unfair trade practices and threatened punishing tariffs and upended diplomatic protocol by speaking by phone with the president of Taiwan, which China claims as part of its territory. Xi, the first Chinese president to attend the Davos meetings, will champion multilateralism at a time of global economic uncertainty and worries that countries will turn inward to trade protectionism — an issue that has risen in prominence with Trump's pledges to restrict access to American markets to promote the U.S. manufacturing industry. On Tuesday, Xi will give a speech urging leaders to "steer globalization in the direction of more inclusiveness and mutual benefit," Li said. Western countries and companies accuse Beijing of maintaining its own protectionist practices, for example subsidies for its bloated steel industry that have led to trade tensions over Chinese exports of low-priced steel. Li said accusations of trade protectionism against Beijing were "unjustified," and that China has always opposed such measures. "Trade protectionism will lead to self-isolationism and it is in the interests of no one," he said. Xi's attendance at Davos is part of an official four-day visit to Switzerland that begins Sunday. He will also visit the U.N., World Health Organization and the International Olympic Committee, and discuss with Swiss officials how to deepen trade cooperation following the signing of the 2013 China-Switzerland free trade agreement, as well as how to encourage their business communities to collaborate on innovation. In the past, Chinese delegations at Davos were led by Premier Li Keqiang. China has sought to be more influential globally and present itself as a force for stability and champion of globalization while opposing rising protectionist sentiment in the West. The Davos forum takes place during a week when the United States, the world's largest economy, will be focused on Donald Trump's Jan. 20 inauguration as president.